February 27, 2017 – Today, Florida TaxWatch held individual ceremonies for each of the top winners of the Principal Leadership Awards (PLA). Each winner was recognized at their school in front of their students, faculty and staff. 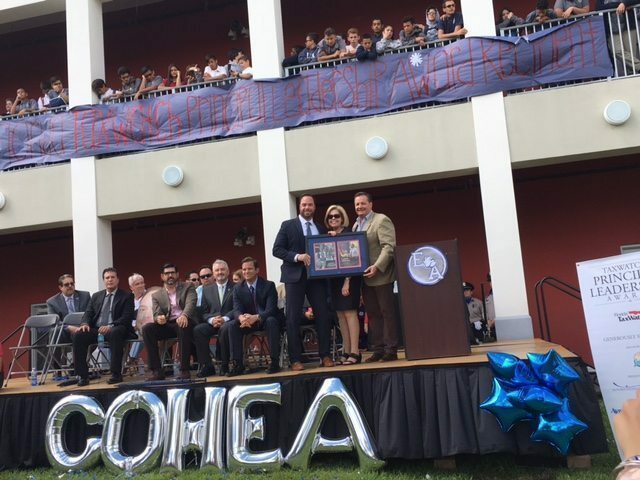 Events were held at Somerset Academy Elementary – Miramar to honor Principal Alexandra Prieto and at the City of Hialeah Educational Academy to recognize Principal Carlos Alvarez. Both Prieto and Alvarez earned top honors at the Principal Leadership Awards Ceremony in Orlando in November 2016. In support of the principals and to say thank you, representatives from the Florida Lottery attended the events along with Lieutenant Governor Carlos Lopez-Cantera and Hialeah Mayor Carlos Hernandez attended the ceremony in honor of Principal Alvarez, while State Representative Manny Diaz and former Hialeah Mayor Julio Robaina attended Principal Prieto and Principal Alvarez’s ceremonies. Rep. Diaz gave Principals Prieto and Alvarez a proclamation from the Florida House in honor of their achievements. These events were possible thanks to the support from generous sponsors, including The Florida Lottery, J.M. Rubin Foundation, BrightStar Credit Union, Verizon, State Farm, Florida Association of School Administrators, Wells Fargo, the Florida Press Association, the Florida Prepaid College Foundation, Universal Orlando, Ajax Building Corporation, Bright House Networks, Kyra Solutions, Lifetouch, AAA – The Auto Club and the Tampa Bay Times .